Apart from private charters, we also offer cruises on a shared- yacht basis for individuals, couples and small groups. Our Cabin Charters have guaranteed departures from Marmaris, Antalya and Bodrum and generally run from Saturday to Saturday from late April through to October. On the first day of the charter, you will be transferred from the airport or your hotel to the yacht. If it is from the airport, your transfer will take between half an hour and three and a half hours, depending on your airport of arrival. This cross-country trip will give you an opportunity to view the landscape and observe the locals going about their work. The following morning, the yacht departs from the harbour and begins a leisurely tour, returning to port late the following week. More information concerning departure dates and prices are given in our Tariff Sheets. click for price information. Cabin charters are traditionally made by wooden Gulet and our fleet of these vessels accommodate between 8 and 12 persons, depending on the final group size. A yachts name will not be avail- able until the day of departure, as numbers will only be known a day or two prior to the tours commencement. Diving enthusiasts can join one of five cabin charter diving tours during the season. Diving cabin charters start and finish in Bodrum, just a half hour drive from the Bodrum Airport. You may like to opt for a one-way tour between Bodrum and Marmaris, during which time you will visit two Greek islands, either Rhodes or Kos and Symi. These tours alternate over a fortnight, the first weeks cruise being Bodrum - Kos - Marmaris, and the second weeks cruise being Marmaris  Rhodes  Bodrum. Gulets cruise from place to place, raising the sails when the wind is favourable. If sailing is important to you, please make this known to us when you make your booking  this way, you have the opportunity to join a group of like-minded people aboard a sailing yacht. Your captain will see to it that your cruise moves along at a good pace. He decides on departure times, excursion times and meal times according to the composition of the group, the day of the week and weather conditions. The captain is responsible for the safety of the vessel and its passengers and has the right to alter the itinerary when necessary. Group composition makes for an interesting tour: do not be surprised if you share your yacht with a number of different nationalities. Meal times will provide you with a good opportunity to get to know one another and you will find that strangers who share a love of the sea and an interest in nature and history quickly turn into friends. The crew aboard our Gulets and yachts often do not have a foreign language mastered, but they almost always know a few every- day phrases and are able to understand almost all requests. For each scheduled departure trip, there is the option of a mini cruise, a half week tour made up of three nights on board. If you would like just a half-week cruise, you pay half the normal weekly price and go just one way. 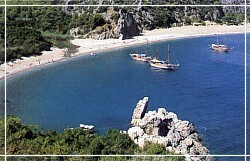 This tour starts and finishes in Marmaris, taking in the pine- forested beauty of the Gulf of Fethiye. Guests are treated to an afternoons excursion to the ruins of ancient Caunos and the river-side town of Dalyan. Local drinks are served complimentary with lunch and dinner. Enjoy the Turkish coasts cruising ground to the full by joining a group of other sailing enthusiasts for a week of plotting courses and setting sails. Our Turkish sailing vessels range from 36 to 59 feet in length and are offered on an active participant basis under the guidance of an experienced skipper. With departures from G�cek and Marmaris, this is your opportunity to sail some of the best coastline in the world with plenty of time set aside for leisure pursuits such as snorkelling, skin diving and windsurfing. You do not necessarily have to hold a skippers licence, but we do ask that you come along to experience sailing, and as much of it as possible! Our yachts have a fully-equipped galley, a salon and plenty of deck space. Accommodation is in double cabins, (triple-share is sometimes possible) Each cabin has its own private WC and shower.